Lesson 1 – Installation and Setup, part 1. The first thing one needs to do when installing the Data Analysis (DA) Tool is to first make sure that you’re running Windows (or possibly a Windows emulator on a Mac but this hasn’t been tested here) and, of course, a copy of MS Excel. Excel is needed because the DA Tool uses the inbuilt VBA to run the analysis. I could have designed the DA Tool to be a ‘normal’ Windows application but no matter how well I design the application with a mass of sliders, knobs, wheels, drop downs and what have we it’s never going to be flexible as how it’s designed here. The upside is that the DA Tool is infinitely flexible and can do whatever the user wishes: as long as the data is available. The downside is that one is going to have to a bit of coding to make it work. Declaring variables, i.e. somewhere to put information such as the Rating Position, the number of runners, the going, etc..
Assigning values to the variables so that we can work with them. Testing the variables so we can say things like “if there are more then eight runners” and/or “consider the top rated horse only”. And that’s it. That’s really all that the DA Tool does but we can add as much complexity as we want in our analysis, but the basic premise of these three steps are there. I reckon that someone who is quite unused to any form of programming can start to rattle off a few tests in just a morning. So whilst it looks a daunting task it really isn’t that hard. In fact, using the DA Tool, with the thousands of lines of code within is quite simple as most of the code is ignored by the user. In fact 99.9% of the code is ‘my domain’ and the other 0.1% is what you do. So you worry about that 0.1% and I will look after the rest. I will go further and say that the hardest part of the DA Tool is setting it up, so we’re going to do that now in a couple of steps. This first lesson just creates the basic environment for the DA Tool. So, here we go. Time to gird our loins and dive in. The first step is to open the Windows File Manager. 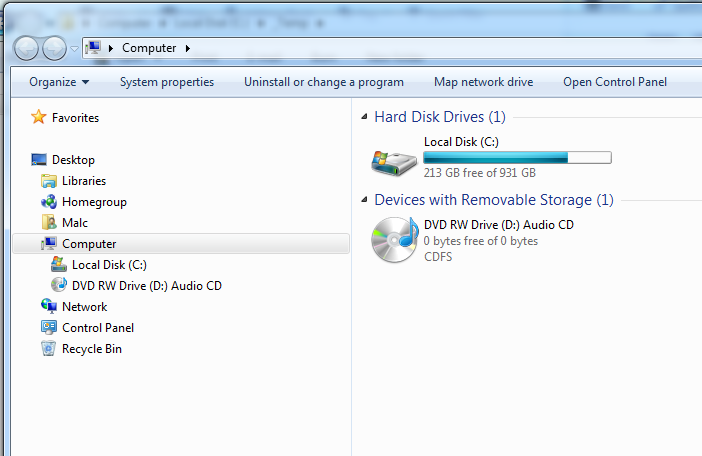 This gives us an overview of the hard drive and the files and folders on there. Now it’s at this point that if there’s any terminology that you’re not sure of then please ask. It’s better to ask questions if you’re not entirely sure what’s going on than to be baffled and then to get stuck because I may easily assume prior knowledge or I have explained everything badly. Anyway, let’s open File Manager. This is the name of the thing that pops up when I type the keyboard chord of ‘Windows’ and the ‘e’ key at the same time. This is how it looks on my Windows 7 machine. You may recognise this with other names such as ‘My Computer’, ‘Computer’ or whatever your version of Windows calls it. I am used to calling it File Manager from ancient days long ago when it was called that and I will continue to call it that because ‘Explorer’ or ‘File Explorer’ (both other names from the history of Windows) is confusing because of the similarity with Internet Explorer. So, I am going to call it File Explorer for the purposes of these lessons. The first set up is to get our environment into shape. Now Microsoft, when they set up the settings of a newly installed operating system, rarely set things up in an optimum manner. They tend to set things up so that things look good rather than how they should look. A dialog box pops up with three tabs and click on the middle ‘View’ tab. The one change that you must make (and this goes for any Windows machine when one gets it) is that the “Hide extensions for known file types” must be cleared. This is an aberration on Microsoft’s part and is only set (or ticked) because the listing of the file names in File Manager looks cool, hip and trendy without the extensions (these are the bits of the file name at the end such as .txt, .xls and so on). But whilst the File Manager looks better without these they make one’s life hell and can cause no end of problems. So the first thing that one should always do is to clear this checkbox. In fact there has never been one good reason to have that checkbox set. So, please, change it now. You will see that there are some other settings such as ‘Show hidden files…’ and ‘Hide protected operating system files’ that I have also cleared. It’s your choice whether you do this or not, I have because it’s my computer and I want to know what’s on it and, besides, another thing that I do is to update the HOSTS file but this is for another discussion. Anyway, clear the check box for ‘Hide extensions for known file types’. If you don’t and then come to me for help I won’t be able to help you because when I want to know the file names in your folders and if you’ve hidden the important part of the name then it’s impossible for me to help. As I have said: there is never any need to keep the extensions hidden. There are also security implications if you hide extensions so, please, clear that check box. Okay, if you can’t see the C: drive under the Computer (left hand window) click on the little arrow next to ‘Computer’ so that you can. 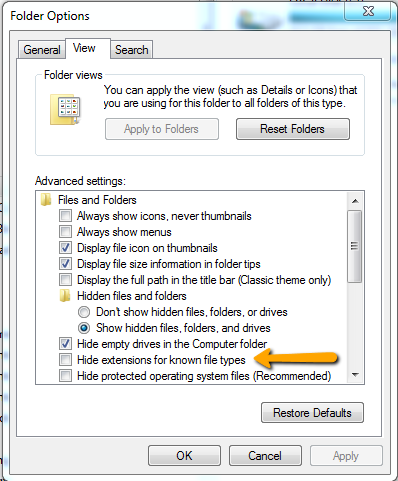 Single-click on the C: drive so that it’s selected then right-click so that a pop-up menu appears. So you now have a new UKHR folder with three folders directly under that one. The folders should be set up like this. And that’s it. That’s the folders set up for the DA Tool. Of course they need not be set up like this but for the purpose of this tutorial let’s make them like this so that I can help sort out issues if they arise. So, that’s it. It should have taken more time to read this than to do the actual process. All you have to do is this and then wait for the next part of Lesson 1. If you have any issues then shout.